The hostel is warm, cozy (think organic), clean and well organised. It features many common spaces with a pleasant atmosphere, including two kitchens, of which one is outdoors in our nice summer garden (have a look at the pictures). The hostel is also a constantly changing ambience & art project, with rooms that have all been hand made, combining aestethics and practicality. Things at Mali Mrak are done in an efficient, honest and spontaneous way, where community, common sense, talks and exchanges of ideas are valued. As long as you respect the house and the people in and around it, you’ll have all our knowledge resources and experience at your disposal, for planning your route through the balkans or anything else we can help you with. The house is also good if you just want to have a quiet time on your own, bothered by no one, to do your own thing. IMPORTANT NOTE at this point: Mali Mrak is NOT a party hostel ! bigger group comes together, we’ll look up one of the rentals in town, prices are usually between 10-13€). • if you're into hiking, let us know – the area around Zagreb is very nice, and we frequently go together. • special note to rpg fans: Numenera & Planescape sessions available, ask at reception! •We can give you invaluable insider advice on Zagreb and Croatia to plan your trips and avoid the traps and bad places, helping you along is part of what we love to do - just ask, don’t be shy! And so on, we also suggest that you browse some of the numerous reviews on the web to get confirmation of what and how we do things here, the travelling community has its own perspective. What follows is information of a more practical nature. Thanks for reading! LOCATION: READ THE DIRECTIONS ON HOSTELWORLD on how to find us, they’re easy and precise. We're located in an ordinary, safe and quiet neighborhood, 15 minutes away by tram from the city center, as well as 15 minutes walking from the nature park 'Grmošćica', located on the foothills of Medvednica, the local mountain. Good if you like hiking & nature. For those who are traveling on a budget and have certain skills- if you can and feel like it, feel free to contribute /upgrade the house in a specific way - we love that (you’ll notice a ton of stuff people have done here) - create something and in return you can get a discount or a free stay. You certainly wouldn't be the first, and we are known to support travelers in many more ways than just giving convenient bed prices. Contact us via email for details on that. The City Tax (7kn per person per night or cca. 1€) is not included in the room price you book online. We have to charge it in any case, and since many wonder what that is, here goes: it's not something any hostel makes up, it's just that - a city tax that goes to the state of Croatia, a way to make money. We must charge it, and keep it separately because of account keeping, so we rather choose not to incorporate it into the bed price (that means: raising that same price for said amount and proclaim 'no additional tax') and charge it separately and show it on your bill. CARDS are accepted, but the 3% bank fee is paid by You, not the hostel! That's all, folks, see you maybe! Hostel Mali Mrak is a really special place, in a positive way ;-) If you decide to stay here you also decide to make friends and having good conversations. Its not a party hostel. If you want to get drunk or high thats probably the wrong place for you. But if you are open to discover real life, friendship and love you should definitely go there. 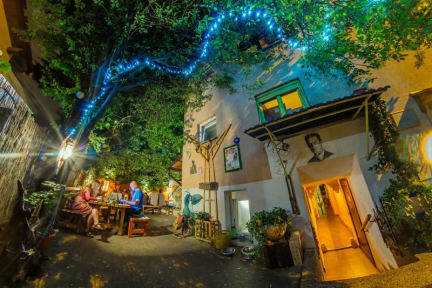 Mali Mrak and Igor is a small Oasis in the chaos of Zagreb. Ich war sehr überrascht von diesem einzigartigen Hostel. Es ist so gemütlich und außerordentlich cool gestaltet. Mich hat die Kreativität sofort befallen und ich habe so gut geschlafen wie schon sehr lange nicht mehr. Mein Bett war perfekt, Igor, der Host ist perfekt, die Outdoorküche ist super, die Menschen sehr entspannt, alles war einfach äusserst gut. Ich werde bestimmt wieder kommen :) Danke für diese Erfahrung! I had a wonderful stay at Mali Mrak. Not only because there were not any problems with the basics - the beds are comfortable, everything was clean and safe (+ very cozy) etc. - but also because of the very welcoming, hospitable and relaxed atmosphere. The staff helps a lot with feeling home at Zagreb - they really know the city - and offers you the feeling that they actually like hosting their guests. Great environment for meeting new friends. Hvala! Ein einmaliges Hostel-Erlebnis - vom Gefühl her eher eine grosse WG als ein Hostel. Ivana und Igor sind wunderbare Hosts - mit Tipps (auch abseits der üblichen Touristenpfade) für das Zagreb-Tagesprogramm, Nachtleben und die Weiterreise. Der Garten mit Openair-Küche ist einzigartig gemütlich, und das Hostel - da etwas ausserhalb vom Zentrum - in sehr ruhiger Umgebung. Danke! We were in this beautiful hostel and staid for two days. Igor the owner received us very friendly and let us felt like we were at home. He and the staff gave us so many good tips for restaurants and places where we could stay. All in all it was a very good time and we can recommend this hostel to every kind of person who want to relax or just going for side seeing trip. We had an amazing stay at this beautiful little Hostel! Mali Mrak was the best Hostel I have been so far. The whole place has developed over the years, you can see that on the house it self as well as on the staff. That creates an atmosphere in witch I felt very welcome. It is a place where you can overhear somebody playing guitar in the next room and where you can have discussions about nearly everything over a coffee in the yard. You will get any support you need but wont be pressured into anything. I have had a great time. Thanks! 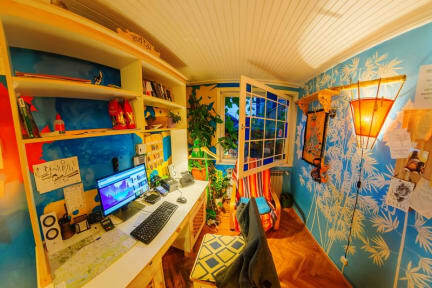 The Hostel has a unique and inviting atmosphere. Igor and the volunteer Annabelle were always helpful and connecting very well with the guests. It is not too close to the city centre but absolutely manageable by public transport. Beautiful common area and the outside kitchen is outstanding! Might be the best Hostel I have ever stayed at. The people that run the place were amazing, knowledgeable not only about Zagreb but basically all of the Balkans and helpful in every way. The atmosphere is extremely welcoming, and makes it easy to meet people to go out or just sightseeing with. The place itself feels very different and handmade. Facilities are clean, well maintained and there are plenty of them. Basically: Read the description, if that sounds like your kind of place, go there.